What do Iceland, Finland, Norway, Sweden and Rwanda have in common? Not a lot, at least at first glance. For starters, all four Nordic countries are what the World Bank classes as high income, while Rwanda features on the UN list of 48 least developed nations. The disparity continues in almost every single area you can imagine, from electricity access (100% for the Nordics, 20% for Rwanda) to life expectancy (as high as 83 in Sweden compared to 65 in Rwanda). But in spite of all these differences, there’s one character trait they all share: they’re the five global leaders when it comes to gender equality. How did Rwanda – one of the poorest countries in the world – end up in this position? First, a word on methodology. The Forum’s Global Gender Gap Report is not a list of the best places in the world to be a woman. Just because Rwanda comes in at 5 does not mean that women there have it better than their counterparts living in France (17), the UK (20) or the US (45), for example. What the report instead tries to measure is how far countries have (or have not) gone in closing the gap between men and women across a range of different measures. How much harder is it to be born a girl than a boy in any one of the 144 countries included in the ranking? The advantage of this approach is it sets a level playing field for all countries, regardless of their current development status, and allows us to see how even some of the poorest places in the world are managing to make progress towards gender equality. The Global Gender Gap Report looks at four areas in particular: health, education, economy and politics. In two of these, Rwanda is head and shoulders above many other more developed countries. Let’s start with the economy. At 86%, Rwanda has one of the highest rates of female labour force participation in the world. In the US, for example, that figure stands at 56%, and has even been declining since the turn of the millennium. Not only are participation rates high, but the wage gap is narrower – in Rwanda, women earn 88 cents for every dollar men do; in the US, it’s just 74 cents. This high rate of female workforce participation is in part out of necessity, and has its roots in the country’s devastating genocide. Over two decades ago, around 800,000 Rwandans were slaughtered in the space of just three months. In the wake of these horrific events, women made up between 60% and 70% of the surviving population. They had little choice but to fill the roles once occupied by men. Does sharing salary data make the gender gap worse? A similar trend played out in the US during World War II – as men went off to war, demand for female workers grew significantly, as did wages. But once the war was over, things quickly returned to business as usual. So what did Rwanda do differently? It put in place policies to help keep women in work. Unlike in the US, for example, women in Rwanda now benefit from three months of paid maternity leave, making it much easier for them to stay in the labour market once they’ve started a family. The US is the only developed nation in the world not to mandate paid maternity leave. These pro-women laws might have something to do with the second area in which Rwanda leads: female political participation. 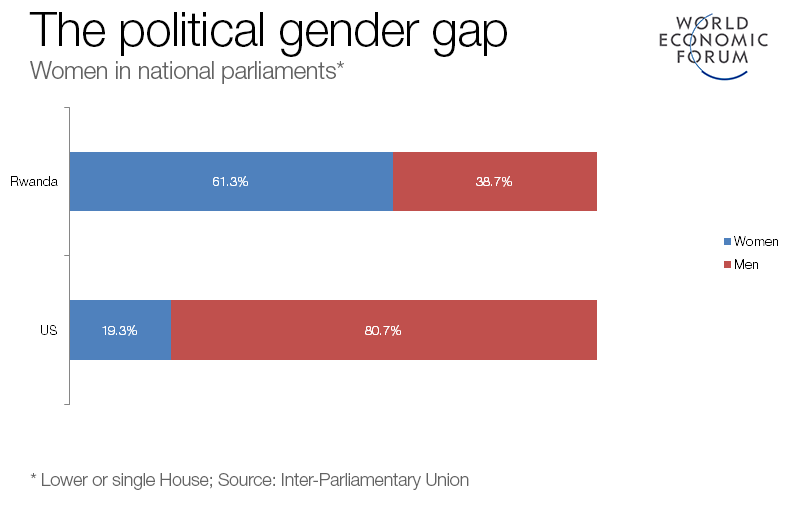 Every year for over a decade, Rwanda has topped the global list of countries with the most female political parliamentarians. That’s in large part thanks to quotas, put in place following the genocide, stipulating that women must make up 30% of parliamentarians. Compare this to the US, where it’s been predicted it will take 500 years for women to reach fair representation in politics. Why does all this matter? Because, as we’ve pointed out in the past, when women work in politics, research suggests they put important but otherwise neglected issues on the table. That can have a significant trickle-down effect, benefiting women from all walks of life. Rwanda is one of only five countries to have closed at least 80% of its gender gap. But that doesn’t mean it can rest on its laurels. For one thing, while 80% is quite an achievement, the real celebrations can start when the gap is completely closed – something no country has yet achieved. More importantly, though, the Global Gender Gap Report inevitably doesn't capture all the issues that really matter to women and influence their lives. In Rwanda, for example, Human Rights Watch has lamented the slow pace at which genocide-era rapists have been brought to justice. Violence against women is also shockingly high. According to data released by the country’s Gender Desk, in 2011, 93% of victims of physical and psychological abuse were women. 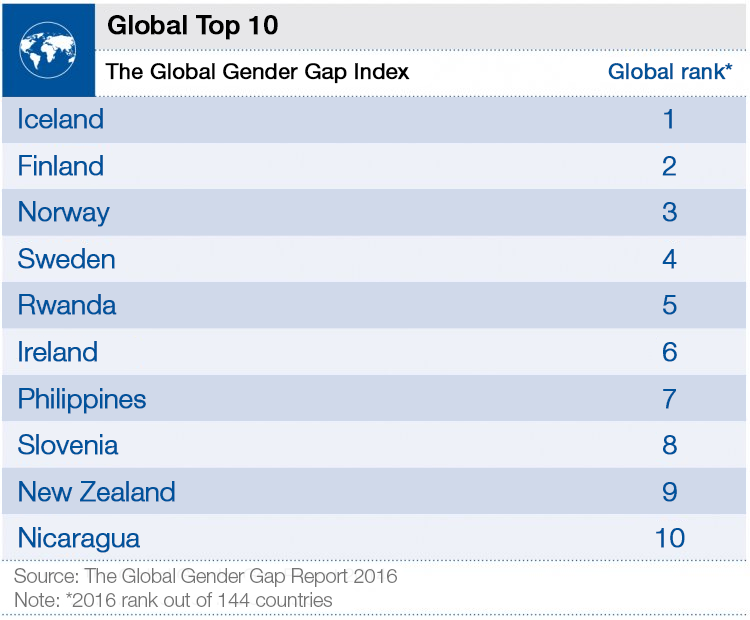 Unfortunately, even in the most gender equal countries in the world, there’s still much progress to be made.